This year was the worst. Because of the drought the sign planter stayed unplanted from November through January, and the cats noticed, notably Liam. 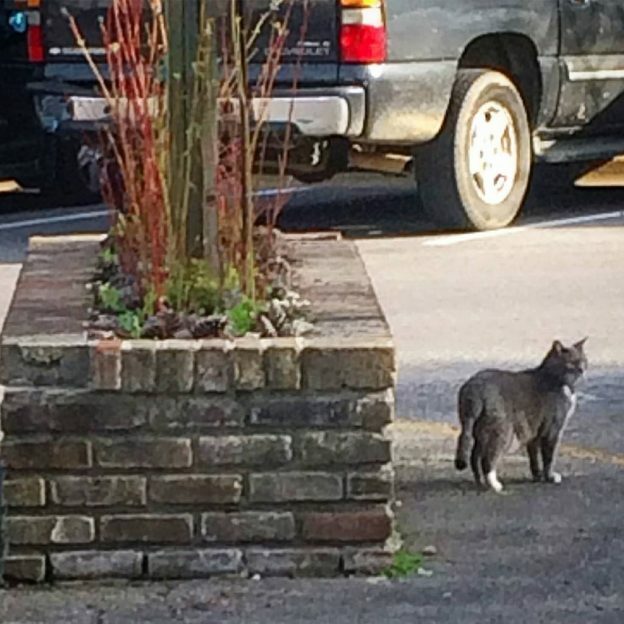 There’s nothing worse than standing out front, helping a customer and seeing your cat, out of the corner of your eye, doing his business…ohhhhhh it was getting more and more agravating. I didn’t want to plant pansies, simply because I wanted to have as many as possible for our customers. So, when some iceland poppies in cell pack flats became available, I grabbed a flat and planted them in the offending spot. I wish I could say Liam took the hint. He did not. So, this past Saturday I took matters into my hands again, vowing to do all I could to keep him out. I’d already snatched him up repeatedly, toting him to the back of the greenhouse where the two litter boxes (cleaned religiously for them) resided. He would only hop out, give me a baleful look, and avoid me the rest of the day. I had figured out my strategy the day before, and, on a sunny but cool Saturday morning, I got to work. Bert gathered pine cones from the side garden (I told him I needed a lot of them.). 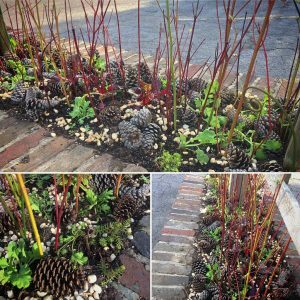 I pulled some tall, loose stems of the red twig dogwood and cut them to various lengths. There was a pot of washed pea gravel in the greenhouse, and I brought that outside too. Bert began placing the pine cones between the tiny poppy plants, clustering them in various spots. When he had placed them all, I began arranging the red twig dogwood throughout the planter. This will fix him, I thought. 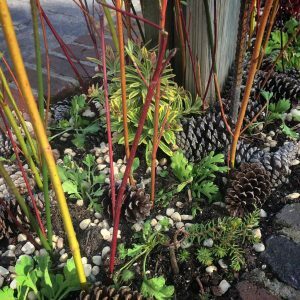 Once the stems were in place, the pea gravel was distributed between the pinecones and branches, and, finally, a few faux fern fiddleheads were placed on either end. Voila!!! A (hopefully) cat-proof planter. I will report back on how it worked. This entry was posted in Container, Decorating, Staff News and tagged cat proofing, sign planter on February 12, 2017 by Kris Blevons.